As a E-commerce company, we are specialized in Business and Industrial Products, Home and Garden products. Our vision and mission to provide innovative products with best service and competitive price to satisfy you. Our mission is make sure that you can find exactly what you are looking for and make it easy for you to place your orders. 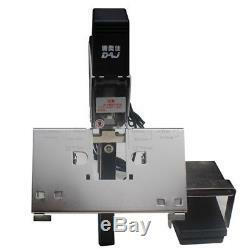 Product Name: Electric stapler Binding thickness: 2-50 sheets (80 g) Size: 250 (length) × 285 (width) × 438 (height) mm Width250mm(with wide table). 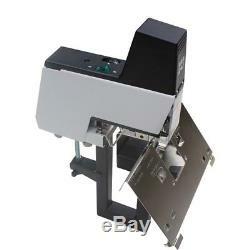 60mm(With narrow table) Length250mm Height483mm Magazine210 Rapid 666-8mm staples CapacityUp to 40 sheets(75gsm)in flat stapling. 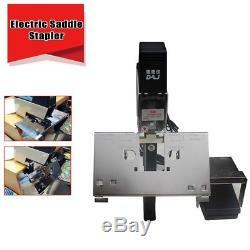 Up to 20 Sheets(75qsm)in saddle stapling SuppliedTable. The design is uniquely suitable for flat nails and saddle stitching. It can be used as a single or continuous multi-station, saving time and effort, increasing production power, making the nailing work more convenient, simple and easy. Adjustable depth 100MM Can be used as a single or serially connected multiple units, can be connected in series with several heads for synchronous nails, does not take up space, greatly increases work efficiency and attaches a safety foot switch Double-edge margins are adjusted freely, and two sets are made at a time, and more than 60 times in one minute. High-strength nail head, high quality and durable. 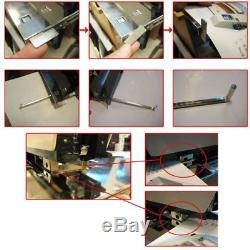 The configuration of the product can be loaded with 210 nails without frequent nail changes. With a binding pressure knob that controls the 9-section nailing force from light to heavy The paperboard can be adjusted according to the needs of flat or saddle stitching, and the tie rod type edge gauge is attached on both sides. Photo color might be a little different from the actual product due to color display of different monitors. The size is measured by hands, please allow minor error of measurement. Cancellation request should be submitted during this period. Or unpaid dispute will be open automatically. The date may be delayed due to uncontrollable reason. The images are for reference only. Please take the item you get as the standard. Please indicate your personal requirement such as colors, packages, value of declaration etc. At message when you pay to us. Please note that the return address must be provided by us. We will reject all return of the package without agreement, regardless of whether a return request is filed. All questions will be replied within 24 working hours. 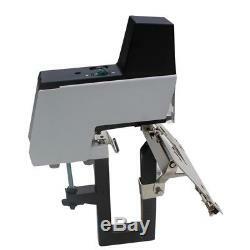 The item "Electric Saddle Stapler Bookbinding Machine Ring Binder Riding Binding Stitcher" is in sale since Thursday, December 13, 2018. 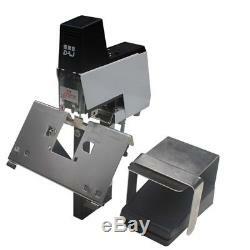 This item is in the category "Business, Office & Industrial\Hand Tools\Measuring Tools\Other Measuring Tools". The seller is "uk*vogue" and is located in China.